Take a much-need break from work or school on this dynamic adventure that will be like nothing you’ve ever experienced. 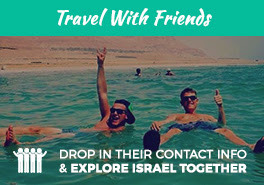 Explore Israel for 10 days with awesome Israelis, gaining the perspective of the locals, all while meeting great people. Travel with people who you can count to have the same appreciation for brunch hotspots, networking happy hours, DC sports, & the occasional excursion to the National Mall Make things easy for yourself by flying from DC & get ready for the adventure of a lifetime! All Washington DC community trips are run in partnership with the Jewish Federation of Greater Washington. "I loved Shorashim because when they say Israel with the Israelis, they mean that you will meet and bond with amazing Israelis who want to share their country with you and make you feel like this is not you leaving your home, but rather you coming home."